I spent as much time exploring the Isle of Eigg as I could. The island offered me my first view of Scotland and it was enchanting. Much of Eigg was the rugged, green countryside that comes to mind when you think of Scotland. But as I wandered the island, I found more of its hidden-away and secret places, and revealed a different facet of the island’s character. September 2017, single image, additional exposures for highlights, focal length 16mm, aperture f/11, shutter speed 61 seconds, ISO 31, 10-stop ND filter, tripod. To give you an idea of the remoteness of Eigg, there is just one road on the island, which is home to fewer than one hundred souls. At the end of the road is a home that once was a place to stay for J.R.R. Tolkein. There has been a long standing local story that Tolkien stayed in it in the 1930s or 1940s and that the views of Rum had inspired him in writing Lord of the Rings. The island — especially its more distant corners — has a mystical, fantastical quality. It wouldn’t surprise me to see a sorcerer emerging from one of the island’s caves. Your imagination tends to venture into ancient worlds in a place like Eigg. In my exploration of the island I found a place along its pebbled coastline. The morning was heavy with rain and in the distance the Isle of Rhum was already shrouded by clouds and was barely visible. The place seemed far away from the more people — if they can be called that — parts of the island. Here, civilization seemed very far away and the clouds that hung over Rhum seemed to portend something more ominous than a storm. I wanted to capture the way that moment felt in that place. I wanted to capture — somehow — the mystical, otherworldly atmosphere of the island’s coast. Using a very long exposure, I focused on the receding waves to emphasize that ethereal quality. I included the pebbles on the beach as a contrast to the white mist. The result is a photograph that encapsulates the feeling I had on that day, standing at the edge of Scotland. 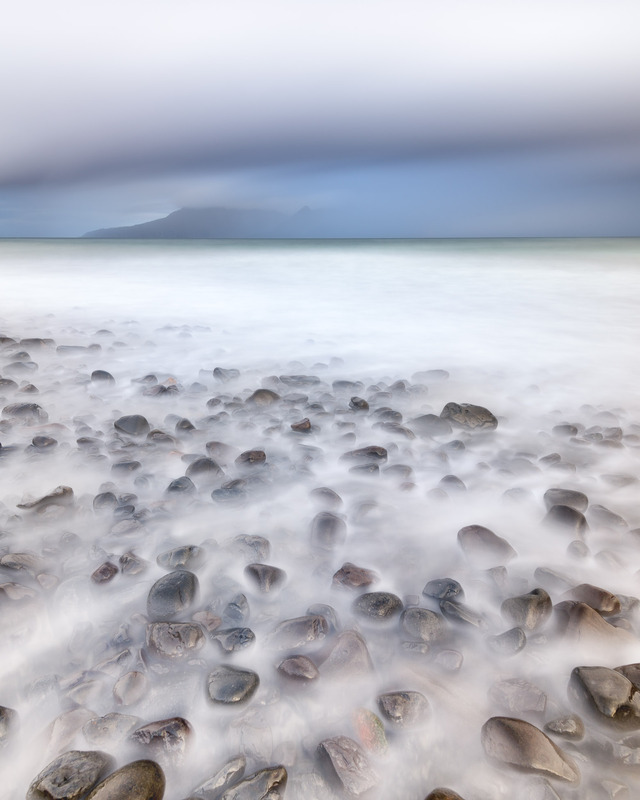 This entry was posted in Landscape and tagged Isle of Eigg, Scotland, United Kingdom.